It is becoming increasingly clear that water, sanitation and hygiene services are delivered not only through infrastructure, but through an underlying support system that keeps infrastructure productive and efficient. Systems are the networks of people, organisations, institutions and resources required to deliver services. Several bureaucratic, social, technical, and financial factors constantly interact and thus impact on the service delivered. Since 2012, IRC –International Water and Sanitation Centre, has been promoting the systems approach to the delivery of water, sanitation and hygiene services. IRC has particularly piloted the systems approach in Kabarole District, Rwenzori Region, working in partnership with District Local Government and other actors. To understand the local WASH systems factors and interactions, IRC conducted an analysis in Kabarole district, using three methods namely: factor analysis, network mapping and building blocks analysis. Factors were analysed according to their relationship and influence on major outcomes for sustainable WASH services. The most important factors identified were: operation and maintenance; local government capacity; community ownership of water points; technology; private sector involvement; political involvement; coordination; water resources management; and financing. Financing and coordination remain the most critical pathways. Network analysis was used to identify the most critical stakeholders in WASH service delivery and how they relate to each other. It was concluded that District Councillors are most central to the network of stakeholders. District Local Government also plays a central role. A key gap identified was that many communities are isolated from the broader network, hence need to ensure community involvement. IRC's systems approach is based on the conviction that reliable and sustained WASH services must be delivered by strong and competent national and local systems. It requires nine key building blocks to deliver a comprehensive WASH system including: legislation, institutional set up, infrastructure implementation and maintenance, monitoring, planning, financing, regulation, water resources management, learning and adaptation. The failure of services is a symptom of the failure of systems: calling for systems change and systems strengthening. To strengthen WASH systems, IRC and other partners have introduced several approaches including the development of a comprehensive District WASH master plan and the formation of a District WASH task team to champion the implementation of the masterplan. The District WASH Master Plan articulates the long-term priorities of the District and provides a framework for planning, coordinating and guiding the implementation of water sanitation and hygiene service delivery. The district WASH task team does advocacy and steers progress towards the attainment of universal access to Water, sanitation and hygiene services in Kabarole district by 2030. The District WASH Masterplan was the result of the collective input of multi-sectoral actors in the district representing district political and technical leaders, religious leaders, CSOs, private sector actors, media practitioners and Ministry of Water and Environment. This is affirmation that attainment of universal WASH for all, calls for a multi-sectoral and multi-stakeholder approach. 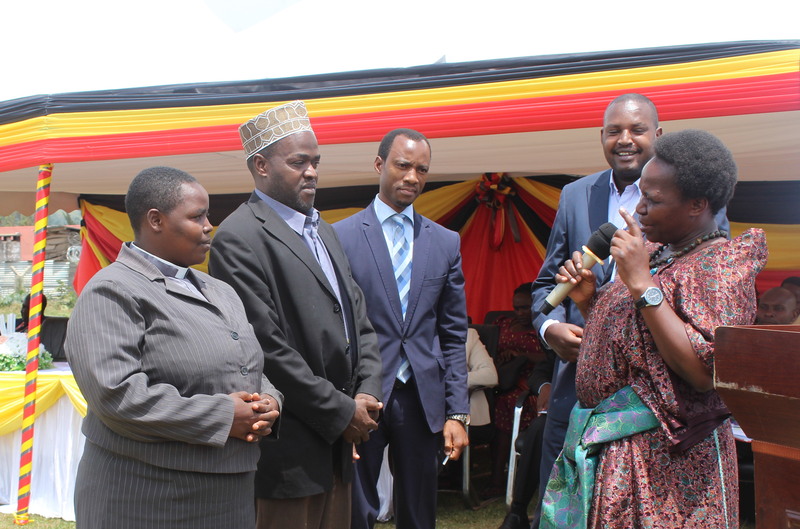 On Thursday 28th February 2019, Hon Jennifer Namuyangu, Minister of State for Local Government launched the Kabarole District WASH Masterplan. She emphasized the need for all actors to play their roles to ensure that all citizens access water sanitation and hygiene services as required by Sustainable Development Goal Six (SDG6). She urged the District Executive Committee as the top political organ, and the Chief Administrative Officer as head of the technical services, to work together with civil society, private sector and community members to achieve the targets expressed in the masterplan. Minister Namuyangu also called upon development partners to align all their interventions to the framework provided by the masterplan. "I urge all current and potential development partners to make this comprehensive masterplan their point of reference whenever they are giving support for water, sanitation and hygiene. This will ensure harmonization and alignment to the district development priorities. It will also reduce duplication of efforts and resources," she said. If successfully implemented, the Kabarole District WASH masterplan promises to address a wide range of challenges relating to water sanitation and hygiene. In water supply, the key challenges include: unreliable facilities which break down frequently because of poor operation and maintenance; a high level of contamination of drinking water sources, especially in rural areas; and unwillingness to pay for water services. In sanitation, open defecation is still rampant especially in rural areas. Moreover, many people have not adopted good hygiene practices like washing hands with soap at critical times. Added to the water and sanitation challenges are issues of water resources management. Increasing human population coupled with weak governance and failure to enforce policies and regulations, has led to unsustainable use of water resources. The situation is aggravated by rampant deforestation, poor agronomic practices, degradation of river banks and wetlands as well as pollution from commercial and domestic activities. Because of such activities, Kabarole District has seen deteriorating water quality and quantity, leading to diseases like bilharzia. Hence, the delivery of WASH services is far more complex and demanding than just the development and management of infrastructure. Where there's a weak link in the system, citizens endure poor quality and unreliable services. It is important to acknowledge that often the system may not function perfectly. Many of the building blocks overlap. Depending on the time and context, some building blocks may be more important than others. But the core element of systems strengthening is that for services to be delivered, all building blocks must be present and working to at least a minimum level.